You can't tell your story without traffic. web site and making use of the Internet for extending business success is the next order of the day. Yellow Pages Dead or Just Over the Hill? on the major search engines. It's a new day. e-commerce. In fact going online is NOT an option, it is necessary to stay profitable. Read More. Relationship building takes a long term strategy. Relationship Marketing--build an online family. business and guide you to increasing your income online. at the same time.E-Commerce is a Contact Sport, the more you Contact, the more you Score! to login to a website again! getting stuck in front of multiple offers or any other type of distraction to send out your mailings. 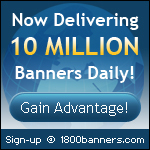 FREE 87 Page Report "Banner Ads are BOOMING"